Plastics and packaging are nearly synonymous. Packaging of all types from food and beverage to consumer goods to durables makes use of plastics because of its durability, consumer friendliness, sustainability and recyclability into myriad new products. 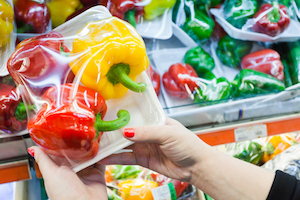 plastic packagingPET is one of the primary materials used for packaging, and the PET packaging marketing is forecast to reach 21.2 million tons by 2021 with sustainability and lightweighting expected to play a major role in the development of the industry, according to a report by Smithers Pira. In 2016, PET packaging amounted to just under 16.7 million tons, representing a 3.8% increase from 2015. Growth for 2016 was projected to reach 4.8%, amounting to 17.5 million tons, with demand coming from new product developments in markets such as preserved foods (think Milacron’s Klear Can and Sonoco’s TruVue); thermoformed food containers; fruit juice containers; and other beverage packaging. However, recent studies of consumers’ food-buying habits are showing that many are moving away from canned goods and toward fresh fruits and produce and prepared meals from the supermarket deli counter. Additionally, big-name food brands are losing shelf space to local or regional brands and smaller start-ups. Market research firm Nielsen said in a May 1 Wall Street Journal report that “sales for packaged food and products—reflecting the number of items sold—fell 2.4% in the first quarter of 2017. Another recent market study from Ceresana focuses on global plastic films. The report from the international market research and industry consultancy noted that “packaging is supposed to be light and handy, neat and durable, microwaveable and also environmentally friendly. ” Oliver Kutsch, CEO of Ceresana, said, “sales of plastic films will presumably reach a volume of about $250 billion until 2024. That’s a lot of packaging, and there are several “megatrends” that are driving this sector. Millennials aren’t just changing the employment picture—they are changing food tastes, as well, which is having an impact on the major processed food producers and the packaging industry.